Description: this medium sized bipedal carnivore sports an elaborate paint job, though brown is the dominant colour, as it is found on the arms, most of the legs, underside of the tail, belly, most of the flanks, throat and most of the head of the figure. A dark green paint job covers the top of the head, neck, very upper part of the legs, topside of the tail and back of the creature, which runs out over the flanks, neck and tail in rounded shapes. Additional green spots are found on the animal’s head, flanks, upper legs and sides of the tail. The same shade of green adorns the otherwise mostly yellow sail in three stripes as well as three rows of tiny spots on each side of the sail. In between the brown and green colouring on the creature's body, a vague line of beige is located, running from the snout to the tip of the tail, though occasionally being interrupted by larger green shapes running out of the colouring on its back. A black JP logo is found on the left leg. The claws on the feet are painted white, but those on the hands are not coloured in a different paint job. The Spinosaurus has beige eyes with black pupils, small white teeth and the inside of the mouth, including the tongue, is coloured pink. The creature assumes a walking stance, with the right leg posed in a backward move. This position causes problems: the sculpt can’t easily stand on its own accord (despite its large flat feet) and quite often must lean on something to stand up (though this tends to differ for each specimen: some have it worse than others). This dinosaur features an attack action: pull the left arm down so the mouth will open, revealing a snake like split tongue, as well as a not very impressive set of teeth. This also produces a roar, which is relatively high pitched, at least more than you might expect of a fair sized predator like this. 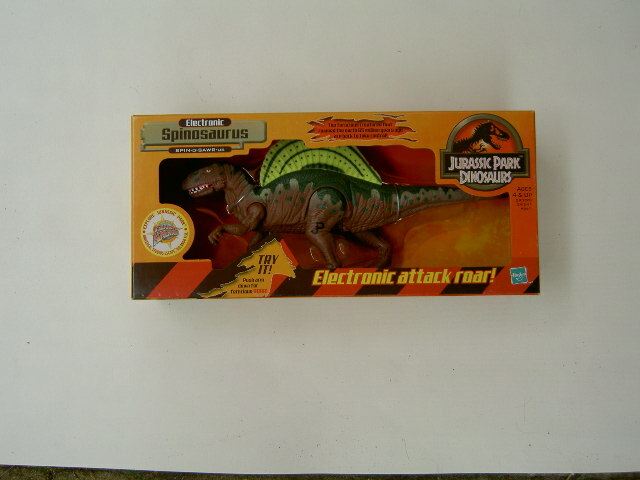 Analysis: the TLW line got some of its electronic dinosaurs repainted too, starting with this Spinosaurus figure. It was never the most successful TLW sculpt, though it was an interesting take on this species before JP III came along. The sculpt remains unchanged, meaning it still has balance issues and a rather unappealing and uninspired biting feature (in fact, identical to the one of the Electronic Dilophosaurus already repainted for this line). The sound is not as much improved as those of the JPS1 electronic repaints of JPD1, but still loud enough to make some impression. Unlike the Wave 1 electronic dinosaur figures, this dinosaur does not come with any capture gear, probably because it's already a bigger sculpt than its Wave 1 counterparts, so cost wise it didn't warrant any. As for size, it seems the reason the electronic Velociraptor and Parasaurolophus sculpts from the TLWS1 line didn't get repainted for this line because they were too big to fit in the designed packaging for the electronic figures of the JPD1 line. Too bad, since those were seriously the better electronic sculpts, but it's interesting to see a new take on this Spinosaurus too. The paint job is really a fifty-fifty situation. On the one hand, the paint scheme is largely identical to the one from the TLWS1 Spinosaurus. On the other, the colours used this time around make you totally forget this. Its predecessor already had an appealing and interesting paint job, and fortunately this sculpt continues the trend with this new colour scheme. Brown and dark green fit well together, giving the beast a murky, earthy look, while the minimalistic use of beige is a good little addition. The yellow sail with the green specks and stripes makes it totally distinct from the light green with purple variation seen last time. It's good to see the claws on the feet are painted this time around, though it's a real shame the same can't be said for the claws on the hands. The beige eyes are a bit of a downer though, a brighter colour would have made them stand out more. So while it's still far from a perfect sculpt, the new paint job at least adds to its appeal, rather than bring it down ever further like we've seen on some other repaints of this first JP: Dinosaurs line. Repaint: yes. This is a repaint of the TLWS1 Electronic Spinosaurus. The figure would not be repainted again. Overall rating: 6/10. Not the best Spinosaurus sculpt around (though very different from Hasbro's later Spinosaurs), but it's decent enough. The paint scheme doesn't score high on originality, but at least the colours are different enough to avoid it being a total copy-cat. This Wave 2 electronic dinosaur is not the easiest find of this line and can fetch relatively high prices, but loose samples can occasionally be acquired at low cost.